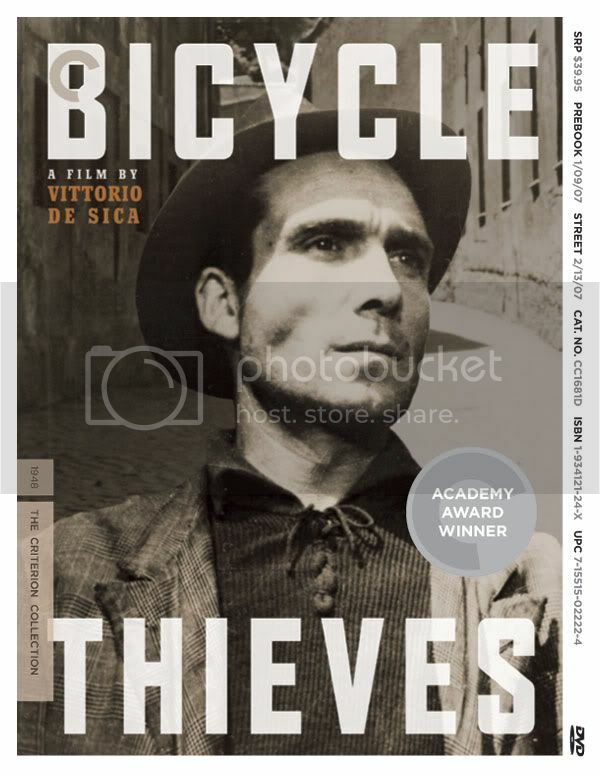 Ladri di biciclette (literally, Bicycle Thieves, though sometimes called The Bicycle Thief) is often cited as one of the greatest films of all time and certainly the best example of Italian neorealism. While it's difficult to ascertain whether it's the best film ever, it's certainly - like Akira Kurosawa's Rashomon - a perfect film. It is entirely flawless, and it manages to infuse its ultra-simple premise - a poor man's search for his stolen bicycle - with tremendous power and grace. We weren't sure what all the fuss was about but now, having seen it, we can understand why it has had such an impact. It's just heartbreaking. The plot seems thin on paper: in poverty-stricken post-war Rome, Antonio (the gaunt non-actor Lamberto Maggioranni), finally manages to get a job. His new boss informs him that owning a bicycle is a requirement for the job and so, after his wife pawns their matrimonial bedsheets, he gets a bicycle. On his first day on the job, the bicycle is stolen. 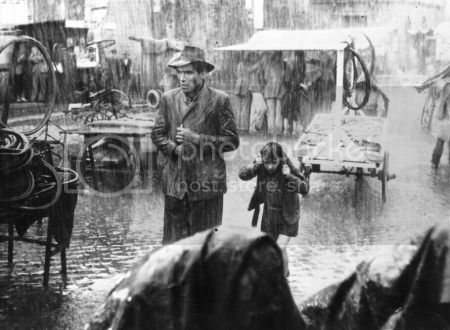 And for the rest of the film, he searches for the thief, with his seven-year-old son, Bruno (the cherubic non-actor Enzo Staiola), throughout a hot, hostile, Sunday Rome. Many people comment on the richness of the neorealist details - on how accurately post-war Rome is portrayed, or how interesting it is that the cast was made of non-actors - but we think the universality and simplicity of the humanity is the best part of this film. It could be anywhere, about anyone who is stuck in poverty. 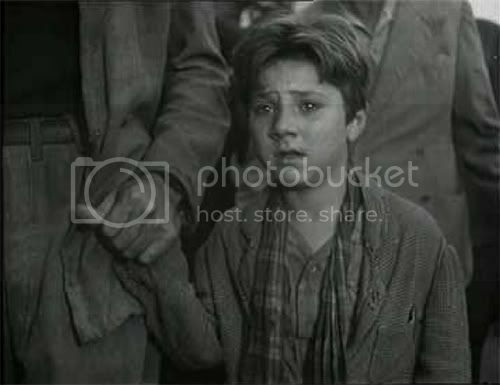 Thanks to the excellent narrative structure, the gentle pacing and the background score, we found ourselves swept along completely by the doomed search for the bicycle - our heart soared when Antonio and his son made up after an argument, and we cried during Antonio's final, desperate attempt to fix the situation. Neorealism is all about not calling attention to the act of filmmaking, and indeed we didn't notice any symbolism, any fancy framing or quirky storytelling device. The story is told with great clarity and earnestness, and it leaves it up to you whether you want to turn bicycles into a symbol for something. During the film itself, we were propelled entirely by emotion rather than intellect. And in the end, we only said, "Good!" We can thus add our voice to the consensus: this is a must-see for any cinephile. A fun thing to note is the effect the film had on popular culture. First, it has plagued many a conversation we've had with various intelligentsia wherever we go. We once attended a screening of Satyajit Ray's Pather Panchali which drew interesting parallels between the neorealist portrayals of poverty in both cases. (Yes, they are very similar aesthetically - both even feature cherubic little child actors!) And, of course, it was a huge hit for Italian films abroad, during that golden age when new Italian films were hip and groundbreaking. (Le sigh.) We reckon Italian cinema is still riding the high of being "the place that made Ladri di biciclette and La dolce vita." Within Italian pop culture, we've seen Ladri di biciclette pop up in interesting ways. Our favorite was during (our recently faved) C'eravamo tanto amati, where one character is so moved by the film that he decides to abandon his career and family in order to dedicate himself to writing film criticism/cultural commentary and basically promoting this film as the end-all, be-all film. "This is what they should show schoolchildren!" the character declares. The character is a caricature of the socioculturally-minded intellectual and, later in the film, he loses a fortune during a game show since he can't answer the final question (on, of course, Ladri di biciclette) in the time allotted. It's a funny little tribute to how when a film is too good or maybe just too admired, people (especially us intellectuals!) can get a little too enthusiastic and tend to lose perspective. (Goodness, like the Slumdog mania!) We wouldn't say this changed our reality or inspired us to abandon our career, but it is really, really good (much better than Slumdog!). Obviously something like this would be better than Slumdog! OMG I think i admitted that outloud! I really liked this movie, and i have a puddle-inducing moment right at the end! I cried out "DONT TAKE ANOTHER PERSON'S BIKE" lamberto didnt hear and thats when the tears started flowing! Rum - OMG yes. I didn't want to give a spoiler in the main review, even though most reviews just tell you what Antonio does in the end. But that tracking shot of little Bruno, as he watches his dad pedal away from the angry mob, makes me cry every time I just think about it! I am very much opposed to feeling sad these days. Should I save this for when I am feeling more resilient? Beth - It's pretty devastating, though the worst that happens is bicycle stealing and general poverty. (As compared to The Son's Room, which is devastating and not recommended for when one is already feeling down!) Oh goodness, I'm also having trouble managing my DVD addiction - I am DYING to get Luce dei miei occhi after watching that intro (sci-fi parallels! dystopian urban aesthetic! moody Luigi Lo Cascio! ), even though I still have loads of unwatched DVDs. Oh goodness, I hope this is available on Instant Viewing because I simply must see it. ajnabi - Criterion has released it on DVD with their special Criterioning of it (extras! commentary! stuff!!! ).